If you live in a place where it’s cool and dry, you might not worry about your guitar being damaged or affected by the elements. If, however, you live in a place where the weather varies from hot to cold and dry to humid, or if you travel a lot, the weather may be more of a factor for your stringed instrument. For one former physicist, creating a guitar that could withstand the elements became a passion. 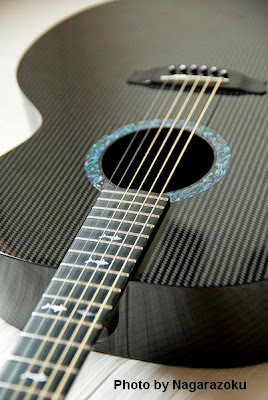 John Decker, who has doctorate in physics from Cambridge University, spent 10 years developing the graphite guitar - an acoustic guitar made of carbon fiber and epoxy resin which looks (and sounds) as good as the name implies. He started a company called RainSong Graphite Guitars that produces about 700 all-composite guitars a year. Creating a guitar sans wood that would be durable and sound good was a challenge for Decker and his colleagues. The "sound" of a guitar depends on what the soundboard - the top butternut squash-shaped panel - is made of. Traditionally, soundboards are made from a wood like spruce or cedar. Even the different varieties of wood affect the tonal quality of the instrument. Choosing graphite for the soundboard was not an overnight decision. Decker and his colleagues experimented first with other materials like fiberglass, which was too heavy, and plastic, which was too flexible. They settled eventually on graphite because its fiber structure was similar to that of wood's and would hopefully mimic the tonal qualities of wood. They experimented with adding other fibers and the proper amount of resin until they got a soundboard that worked. On the RainSong website, Decker uses physics to explain what gives the RainSong guitar its unique "carbon sound". The soundboards on guitars transfer the vibrations of the strings into sound which then resonates in the body. For wood, about half of those vibrations are absorbed and turned into heat instead of sound. This effect, called damping, is heightened at higher vibration frequencies. The damping effect from wood is non-linear, meaning it increases at a higher rate as the frequencies increase. This is why the higher notes on a wooden guitar fade away faster than the lower notes. Graphite, however, doesn't have the same damping properties as wood and the higher notes don't fade away as quickly on a graphite guitar as they do on a wooden one. The graphite is nearly linear and each of the frequencies is damped at almost the same rate. This results in louder treble on the graphite guitar. The linear damping also gives the guitar purer tones by reducing the mixing of harmonics that happens when playing a wooden guitar. Decker was inspired to create a wood-free guitar after seeing a guitarist caught in a rainstorm at an outdoor wedding. The guitarist, he said, had to choose between pleasing the wedding party by playing in the rain and sacrificing his instrument or leaving the event to save his guitar. What if there was a way to make a weather-proof guitar Decker thought, one that wouldn't be affected by changes in temperature and humidity. Those thoughts started him on his decade-long journey which resulted in the all-composite guitar. 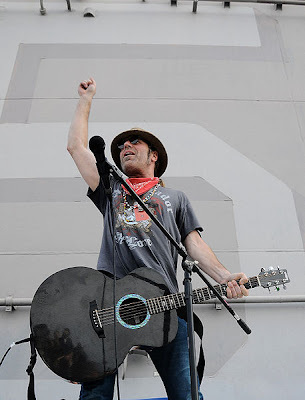 For more on John Decker, including how he switched from a career in physics to a life making guitars, check out this Physics Central People in Physics article. Its nice to know about graphite guitar in this post. Keep updating. I found Chrysalis guitar on Ed Roman's website, one of the world's most exclusive guitars, which has traces of graphite! Los Conchas fire nears Los Alamos Natl. Lab.